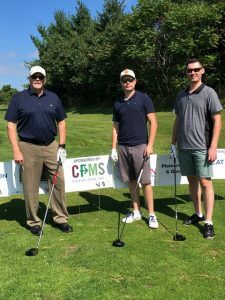 CFMS Consulting Inc. | SCW Canada Golf Tournament | CFMS Consulting Inc. It had been several years since I last attended the SCW Canada charity golf tournament which takes place each September. While recently attending I was reminded of what a great organization SCW is and that the golf tournament is great day. SCW stands for Schools for Child of the World. This organization is a not for profit organization that is run by volunteers. This year was the 10th annual tournament. It took place at Nobleton Lakes Golf Course. It is well attended by Architects, Engineers, Contractors, School Board representatives and Suppliers. The day starts with lunch, followed by a 12 o’clock shot gun start best ball golf tournament, then dinner, presentation and prizes. All amenities from snacks to lunch to power carts are sponsored so that 100% of the money paid by the golfers goes to SCW Canada. Schools have been built in Honduras, Ecuador, and Haiti. During the presentation we learned how important the schools are to the community – they are not just buildings. That the buildings help to bring communities together. The community building starts with the planning and construction of the building. Sometimes the whole community chips in to assist. One school was recently built on a hill. Everyone 12 years of age and up came to assist with moving the bags of cement to the job site. The schools become community meeting places and source of pride. Something else I did not realize is that the school dropout rate for girls after puberty is high. An organization, Days for Girls that has developed a program to educate girls about their bodies and provide them with re-useable monthly supplies. The program was first introduced in Africa where the 80% dropout rate has decreased to an impressive 20%. Days for Girls, through SCW, is introducing the program to Honduran schools. SCW Canada and Days for Girls are two great organizations each run by a generous group of volunteers. The golf tournament is fun day. It is great to mingle with people we see on job sites and in construction meetings, in a casual environment. But the best part of the day is seeing where the money raised is being used and the pictures of the students’ smiling faces. Congratulations to SCW for another very successful golf tournament!